Growing up, I didn’t really learn much about the Progressive movement in the United States or about the history of the Era itself (1890s-1918, although those dates are up for debate). With the exception of World War I itself, many schools nowadays simply pass over this time period and its social, cultural, and political conflicts. Who remembers talking about the 1890s or 1900s in their high school history class? As a student teacher, I was only allowed to talk about World War I, with a brief mention of women getting the right to vote. The Progressives believed in the Hamiltonian concept of positive government, of a national government directing the destinies of the nation at home and abroad. They had little but contempt for the strict construction of the Constitution by conservative judges, who would restrict the power of the national government to act against social evils and to extend the blessings of democracy to less favored lands. The real enemy was particularism, state rights, limited government. I have been learning more about the Progressive Era through my study of the Indiana Grand Army of the Republic, and am now working hard to try and learn more about this fascinating time period. I’ve also noticed that many people today continue to call themselves “Progressive.” It would be safe to say that the theories of progress, efficiency, and reform have continued to play a vital role in shaping the personal ideologies of many people today. However, those that call themselves “Progressive” today may want to proceed with caution and avoid using the term too freely. While many of the goals of Progressives at the turn of the 20th century were admirable [yes, child labor laws are good, most food and drug regulations are good, and I’m glad monopolies are illegal], there was a dark side to Progressivism as well. The consequences of this dark side were felt the deepest in Indiana, which prided itself on being one of the most Progressive states in the Union at the time. Therefore, Be it enacted by the general assembly of the State of Indiana, That on and after the passage of this act it shall be compulsory for each and every institution in the state, entrusted with the care of confirmed criminals, idiots, rapists and imbeciles, to appoint upon its staff, in addition to the regular institutional physician, two (2) skilled surgeons of recognized ability, whose duty it shall be, in conjunction with the chief physician of the institution, to examine the mental and physical condition of such inmates as are recommended by the institutional physician and board of managers. If, in the judgment of this committee of experts and the board of managers, procreation is inadvisable and there is no probability of improvement of the mental condition of the inmate, it shall be lawful for the surgeons to perform such operation for the prevention of procreation as shall be decided safest and most effective. But this operation shall not be performed except in cases that have been pronounced unimprovable: Provided, That in no case shall the consultation fee be more than three ($3.00) dollars to each expert, to be paid out of the funds appropriated for the maintenance of such institution. You can read more about this marker here. 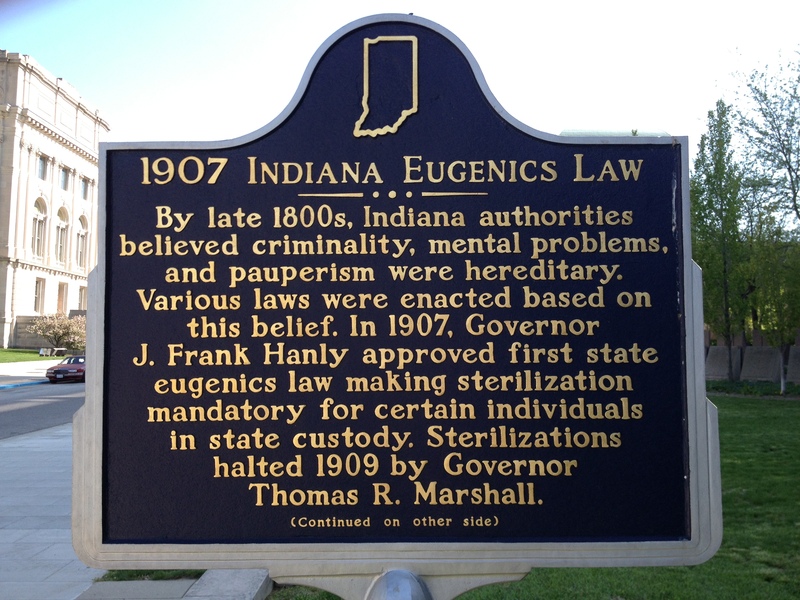 Roughly 2,000 people were sterilized under the 1907 law. 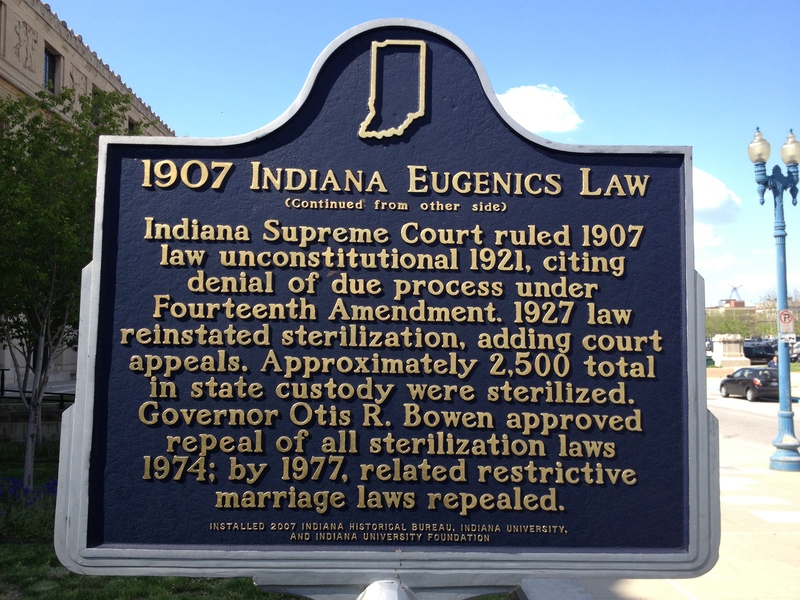 Progressivism as a whole is not completely right or wrong, but a topic like eugenics complicates how we define “progress” and what it means to use the power of government to enact social change. Public history is extremely tough. Public historians must take complex historical topics that are often controversial and painful and interpret them for a public audience of all ages, races, sexes, etc. Each side of this marker is composed of roughly 365 characters, the equivalent of roughly two and a half tweets. That’s all the IHB gets! Keeping that in mind, I think IHB did a great job of summarizing this troubling topic. Even more remarkable (pun intended), of all the historic markers in Indiana, this one is in an extremely prominent location. Thousands of people walk daily along Senate avenue, including state employees, state legislators, and the governor. It took a lot of courage to get this marker erected, and kudos should be given to IHB and any other organization or individual involved in the project. Do you think the marker is well done? If you were in charge of writing the text for the 1907 Eugenics Law, would you do anything differently, and if so, what? Progressive Eugenics is also something I only learned about recently. I was shocked, especially since I had never heard of it, that it had been so obviously hidden. Over 100,000 people were sterilized nationwide! Here in North Carolina, however, sterilization has recently become big news. Over the last several years legislation has grown through the State Senate to provide funds for the remaining victims and issue a formal apology. In the Old North State some seven thousand people were sterilized. Thanks for writing the blogpost on this.